TWENTY years after the first turbine Thrushes appeared in the United States, an example has finally reached New Zealand shores; an example of the most popular version, the Pratt & Whitney PT6A-34AG fitted, double cockpit, S2R. I HAVE never been one to dwell much on the past. To my mind there is plenty going on in the here and now to keep me more than occupied. 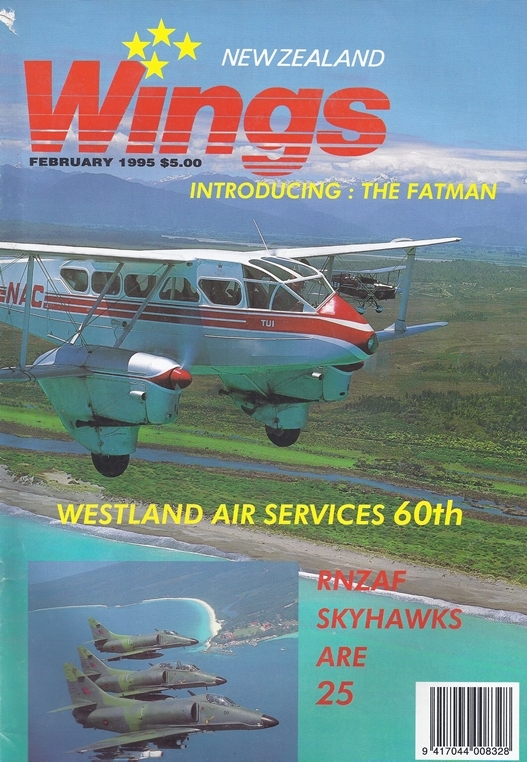 But when I was told by NZ WINGS Editor, Ross Macpherson, that there was a chance of stepping back in time by 25 years - of riding in a Skyhawk again - I jumped at it. I THOUGHT that I was going to finish up the last day of 1994 on a high note but, with a 25-30 kt plus 'nor-wester' blowing, it seemed sensible to put it off and perhaps start off the first day of 1995 with a buzz instead. So there I was, on New Year's Day, at Omaka Aerodrome at Blenheim, eyeing up a Gippsland Aeronautics G.A.-200 "Fatman". Yak 3 In The Air. Mike Weir Writes Of Reno 94. Newly Arrived Fatman In Action. Ray Patchett In Ga200 ZK-CMC Takes Care Of A Crop Of Blenheim Beans. Ross Macpherson Photograph.